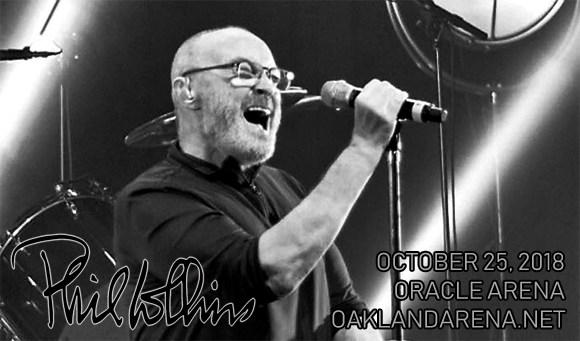 Legendary British singer, songwriter and musician Phil Collins comes to Oracle Arena on Thursday 25th October 2018 as part of his playfully titled Not Dead Yet Tour! With classic singalong hits like "Easy Lover" and "In the Air Tonight", Collins will be showcasing all the best singles and songs from his award-winning career at this very special show! Phil Collins is one of the world's best-selling artists, having sold over 150 million units both as a solo artist and as the drummer, and later frontman, of English rock band Genesis. Hailing from England himself, Collins launched his solo career in the 1980s after several years of success with Genesis, and went on to have more US Top 40 singles than any other artist of the decade through a combination of his solo work, recordings with Genesis and collaborations with other artists. He is best known for his hit singles "In the Air Tonight", "Against All Odds (Take a Look at Me Now)", "One More Night", "Sussudio", "Two Hearts" and "Another Day in Paradise". Collins has been the recipient of a wealth of awards and accolades over the years, including eight Grammy Awards, six Brit Awards (winning Best British Male three times), two Golden Globe Awards, one Academy Award, and a Disney Legend Award, as well as six Ivor Novello Awards from the British Academy of Songwriters, Composers and Authors, including the International Achievement Award, and a star on the Hollywood Walk of Fame.